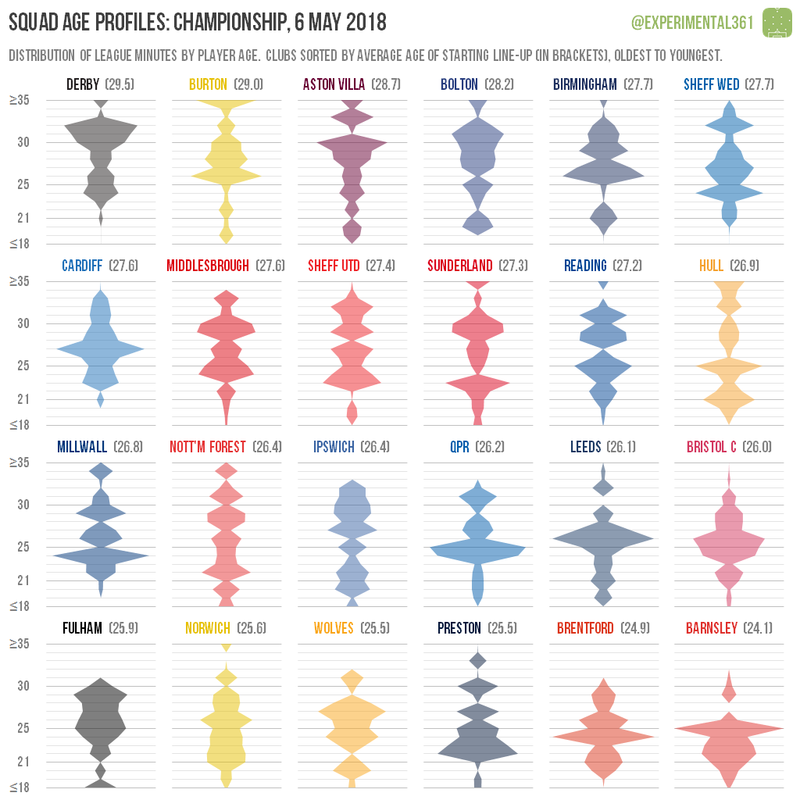 Continuing today’s onslaught of end-of-season graphics for the Championship, here’s an updated version of the squad age profile graphic. Derby secured a play-off spot with the oldest average age in the EFL – their starting 11s have typically clocked in at around 29 and a half. A whopping 55.9% of their playing minutes have been racked up by players in their 30s compared to just 1.1% by those aged 21 or under – the highest and lowest in the division respectively. Cardiff also didn’t do much in the way of blooding youngsters this season: while they were far from the oldest side in the division (almost two years younger than the Rams), they were the only club not to field a player under 21 and gave just 2.1% of their minutes to those under 23. There’s no clear relationship between age and success though, with three of the next four oldest sides all battling relegation this year. The youngest team of all was one of those who failed to avoid the drop: Barnsley‘s line-ups were a shade over 24 on average – the joint-youngest in the EFL – and the 2.6% of minutes they gave to players in their 30s was the joint-lowest in the division (along with Brentford).